Aiming to bring the MMO genre back towards story driven gameplay is Eldevin a title that is simply packed full of game content. The story behind the kingdom of Eldevin is one of a peaceful land that over the past decade has slowly fallen into chaos upon the discovery of powerful Elemental Spheres. These ancient artifacts have attacked the minds of even the most devoted champions leaving only a few fighters and the powerful kingdom of Eldevin standing in the way of Tristan who aims to claim the spheres for himself and the title of Emperor of the Infernal Empire. Using this lore as foundation Eldevin takes players across a vast world which intertwines with hundreds of well-written and interesting quests. Environments are highly varied with dungeons, cities, forest areas and everything in between. This mixture of underground dark areas and more open plains is a great balance that makes Eldevin feel quite realistic. In terms of actual role playing gameplay Eldevin adopts a talent tree system which does not restrict how players choose to build their character. Talent trees include the templar, warrior, assassin, ranger, mage and prophet which makes for an even mix of melee and ranged options. With each level players will assign skills into their choice of talent trees which allows multi class gameplay right from the get go which can be pushed even further with archetype boosting equipment. With well over 200 talents within these trees the choice of character direction is immense and can be respec’d with either free or purchased items. This depth also extends to the professions system which uses over a dozen professions that fall into either a gathering or crafting type. These are levelled up independently of other play stats and includes things like fishing, farming, forestry, prospecting, cooking, alchemy, leather working and weapon smithing. 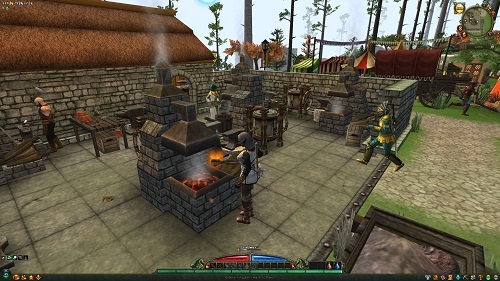 With a wealth of content and strong story based roots Eldevin is an impressive title in the MMO realm. Explore hundreds of story heavy quest lines. A vast world both above and below ground awaits you. Choose your skills from 6 archetypes and 200+ talents. Develop more than a dozen professions that let you gather and craft. Group based dungeons, PvP and unique sets also included.